FRESH plans to build a high-rise hotel on the old ice rink site in Queen Square have been submitted by developers Stonehurst Estates. However, the plans show little change from those that the same developer submitted last year. The MCHA has renewed its objections to this high-rise horror. The previous plans for a six-storey hotel were withdrawn at the end of January, just days before they were due to be considered by the planning committee. More than 200 people objected had objected to these plans. Most of the people who objected to last year’s plans were concerned about the height of the hotel and its impact on the churchyard, the conservation area and nearby listed buildings, notably Wykeham Terrace. The height of the hotel is unchanged in the current plans. And although some of the balconies overlooking Wykeham Terrace have been removed there has been only a minor reduction in the bulk of the building. The impact on the churchyard, the conservation area and nearby listed buildings remains almost exactly the same. The developers want to build a six-storey hotel, which has been designed by the Brighton office of architects Conran and Partners. From the churchyard the six-storey hotel would appear to be roughly the same height as the roof of the multi-storey office block in Queen Square. 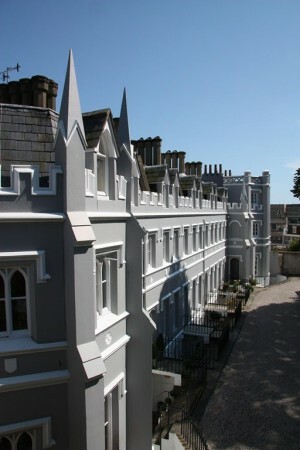 The sheer scale of the building would dominate the southern part of St Nicholas’s churchyard and the back of Wykeham Terrace. Both the churchyard and Wykeham Terrace are listed buildings and together they mark the boundary of our conservation area. We told Conran and Partners in April 2011 that the building was too tall. The council’s planning guidance of March 2009 said that four storeys would probably be the maximum acceptable height on the site. But the developers seem to ignore the critical comments they received then and the 200 objectors to last year’s plans. The MCHA objected because of the impact on St Nick’s and the churchyard and on Wykeham Terrace. All the main local groups also objected to the plans, including the Clifton Montpelier, Powis Community Alliance, St Nicholas Church PCC, St Nicholas Green Spaces Association and the Wykeham Terrace Residents’ Association. Local councillors Lizzie Deane and Pete West also objected.